Rough week with Windows Updates? DR is in! Outlook Web App/Access: Outlook Web App has almost the entire functionality of Microsoft Outlook and it’s included for free with your ExchangeDefender Exchange subscription. Problem is, most users do not know the server name or how to find it in an outage or on the road. We advise our partners to setup a splash page, a link or a dropdown on the clients web site or their own MSP site that leads the clients to the right location. LiveArchive: LiveArchive is included in ExchangeDefender and it’s designed exclusively as a business continuity solution to be used when Exchange and other email servers go offline. Server down? 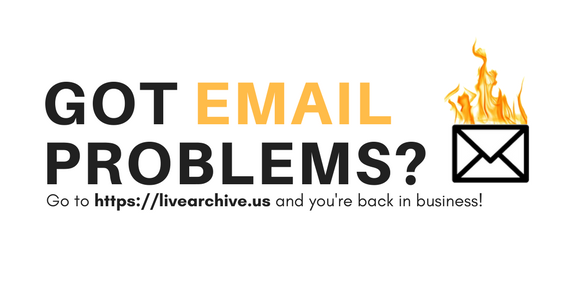 Just point your browser to https://livearchive.exchangedefender.com and all your email is right there even if it’s not showing up in your Outlook due to an outage. Mobile Device: Let’s face it, you won’t be able to pull out your monitor and workstation and take them down to Starbucks when the disaster strikes. Prepare your mobile devices to function as remote offices. You can configure both work Outlook and LiveArchive devices up front and just set them as Disabled or dormant accounts. Doing so allows you to simply “turn on” the mobile feature instead of trying to walk someone through the device setup while they are on the speakerphone and you already have their entire office waiting too. Let’s be real for a second: We know that disasters in IT happen. Mechanical machines that these incredibly complex systems run on are prone to failure: so instead of gambling that the problem will not occur, why not just build it into the onboarding system and take care of the inevitable situation right now where you can do so at your own pace and keep everyone happy.